The Florida Department of State has agreed to pay to clean and maintain the historic Miami Circle site at the mouth of the Miami River in Brickell. The new agreement was announced Monday at the monthly meeting of the Miami River Commission by Vice Chairman Jay Carmichael. The new agreement is for four months, after which the state and river commission will review maintenance procedures and needs of the site. In the meantime, state department officials have begun discussing long-term plans for the site, which could include stations for dog waste bags and disposal, landscaping, new grass, a three-dimensional interpretive display to highlight the buried circle, and other possibilities, according to the river commission. The site is home to a 2,000-year-old Native American circular artifact, uncovered in 1998 during a pre-construction survey, later designated a National Historic Landmark and now reburied. The Florida Inland Navigation District allocated more than a half-million dollars to shoreline stabilization at the site as part of the 2008 agreement, with the department of state to take care of the sensitive area. The new agreement calls for the department of state to reimburse the river commission for costs associated with keeping the site clean and the grass mowed. The river commission has hired a company to pick up trash and dog feces three days a week, and another company to mow and trim edges every two weeks. River commission members were pleased to learn of some movement on keeping the site maintained. Mr. Carmichael said there’s a “new team” at the department of state, and that change resulted in the new agreement and looking to future plans for the site. Late last year and early this year, local officials reported that the park-like property had become a mess, from loads of trash accumulating regularly to illegal parking and a lack of maintenance. At the Jan. 4 river commission meeting a Florida Inland Navigation District representative reported the “sad situation” at the Miami Circle and unanswered inquires it had made to the state department. The navigation district was demanding that the state meet its obligations or risk an action to recover the hefty grant. 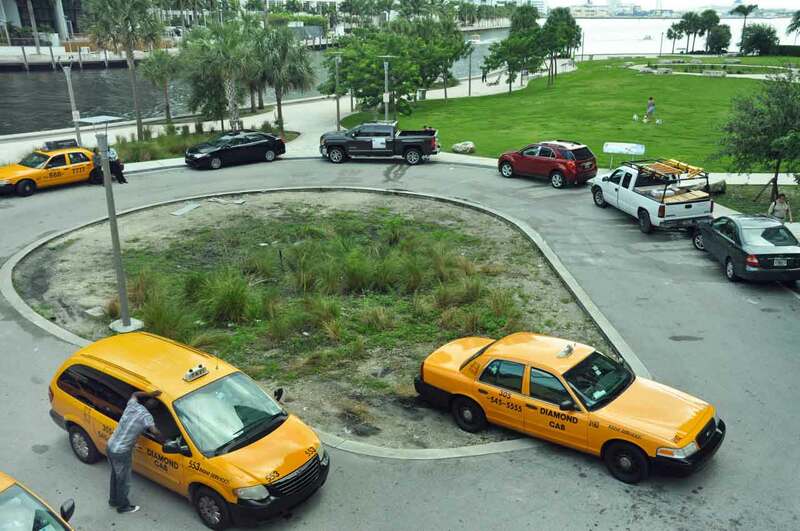 The river commission agreed to draft a resolution detailing its costs to maintain the site and urge the state to assess the condition of the Miami Circle and, consistent with its agreement with the navigation district, to maintain the property. In the 2008 agreement the navigation district provided the department of state with a $548,808.86 grant for the Miami Circle Shoreline Stabilization Project. The resolution was authored by City Commissioner Frank Carollo, who serves on the river commission. “The site is home to a 2,000-year-old Native American circular artifact” and still it’s a shame that people use it as a dog park and a dog potty. I find this to be extremely disrespectful and dog-owners should be fined for that. Thank you—-[“WADO”]—That means THANK YOU in Cherokee Marti—This is the first stages of total dis-respect and it has been going on now for 100’s of yrs. within this “SO–CALLED” REPUBLIC!! All branches of the fed. gov., and state and local govs. are in on it! !